How many things can you say that of? Stocks? Real estate? Commodities? No, no and no. I'm talking about gold. This price action grabs attention. People like to bet on a winner. The gold market is highly politicized. Official intervention is chronic. Governments understand that a "rising gold price" is a universal signal of macroeconomic instability. Gold is still a lousy investment. Gold is rising because the dollar is falling. The dollar is falling primarily because of the extra-super-easy monetary policy favored by the Federal Reserve. Gold itself is -- as I've said previously -- stable in value. It's not going up or down, it's the currency you're comparing against gold. Whenever there are economic difficulties, governments turn to monetary manipulation to bail them out of their problems. Of course this has consequences. From 1789 to 1932, the U.S. dollar maintained the same value. It was 1/20th of an ounce of gold in 1800, and it was still 1/20th of an ounce of gold in 1932. A $20 coin was literally made of an ounce of gold. The U.S. had a hyperinflation in the 1780s. Afterwards, people were very serious about keeping their currency stable. Here's the similar chart, but inverted so that a declining dollar value is represented by a downward line. Ever since the 1930s, we've had an ideology of monetary manipulation. Beginning in 1933, we embarked on a series of experiments: when recession threatens, what if we monkey with the currency in the form of interest rate manipulation and "quantitative easing"? The result of this tomfoolery since 1933 is that the dollar is worth 1/50th of its prior value, or 1/1000th oz. of gold. Maybe the next 50:1 decline will happen faster. Then, it would take $50,000 to buy an ounce of gold. There is a whole library of economic justifications for this monetary manipulation. The short-term effects can feel good. What the economists would really like is to be able to have an "extra super easy" monetary policy with no consequences. All of the upside and none of the downside. Crystal meth abusers probably have similar fantasies. What this means in practice is: an extra-super-easy monetary policy, but no decline of the dollar vs. gold. This can actually be maintained for brief periods. Recently, the government's helper banks -- primarily JP Morgan and Goldman Sachs -- have been keeping a lid on the gold market by selling futures around $1000/oz. (Yes, there is some quid-pro-quo for the obscene banker bailouts.) Usually, they have been able to engineer a minor but sharp decline in the gold price, inducing a brief bout of panic selling which allows them to cover their shorts. Then they start the process all over again. However, this time, they sold a lot of futures short but were unable to cram the market down enough to get people to panic. Apparently, they ran into Middle Eastern and Asian (especially Chinese) buying in the bullion market. Now, the manipulators are getting steamrolled higher with big short positions. In the big picture, this is a minor event. A similar thing happened in late 2005. However, I wanted to explain why you are being fed a truckload of "pleeeeaze don't buy gold" manure by the mainstream media at this time. It's because JP Morgan and Goldman Sachs want to buy gold -- to cover their shorts -- and they don't want any competition from you. Personally, I think that we will have a move higher in gold to about the $1650 area suggested by Jim Sinclair, with a pause around $1200. Of course, what I'm really talking about is a further decline in the dollar. Is gold a lousy investment? Sometimes. At other times, it's a wonderful investment. Over the past ten years, gold has outperformed both stocks and bonds by an immense margin -- just as stocks and bonds outperformed gold in 1980-1999. Here's a funny fact: since 1965, if you owned stocks, bonds, or gold, your investment would be worth about the same today, 45 years later. This is the entire history of floating currencies, which began in 1971. 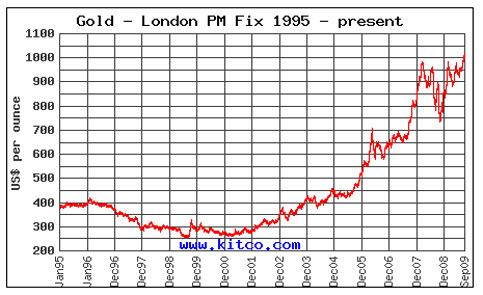 I think that most regular people should consider holding about 20% of their portfolio in gold at this time. The best thing that can happen is that this 20% investment in gold will be flat, or go down slightly. The worst thing that can happen is if this 20% investment rises by several multiples. Because, that would mean the other 80% -- the stocks and bonds -- are getting pulverized in real terms. I think we will have a new gold standard eventually. At that point, I would sell my gold and buy stocks and bonds. However, there will probably be some difficulties before then. It's human nature. It took two world wars before Europeans finally figured out that attacking your neighbors is pointless and stupid. It looks to me like we are going to learn that monetary manipulation is pointless and stupid. We are going to learn why a gold standard was explicitly mandated by the U.S. Constitution. We are going to learn it all the hard way.